Legs facing upwards from sea of flying limbs. 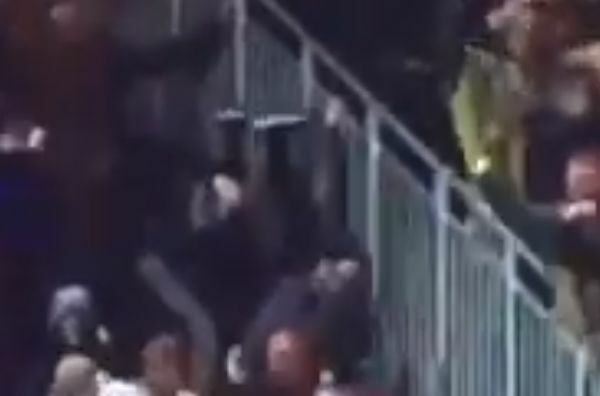 A Wolverhampton Wanderers supporter celebrated Raúl Jiménez’s goal in the FA Cup quarter-final win over Manchester United while upside down. As pandemonium ensued following the Mexican forward’s 70th minute opener in Saturday’s game, the proverbial limbs were flying in the stands at Molineux. That was me mate! Ended up under the temporary stand nearly! Good job me mate @PardoeWolves grabbed us! Noticeable as the camera panned along the scenes of delirium was a pair of legs facing upwards in the air, with the owner’s head and torso obscured from view. There was more wild celebration as Diogo Jota added a second just six minutes later, with Marcus Rashford pulling one back for the visitors in stoppage time. Wolves will take on Watford at Wembley in the semis for the chance to face Man City or Brighton in the FA Cup final.